- The fish should have clean, glossy skin with intense colours, without any cuts if possible. 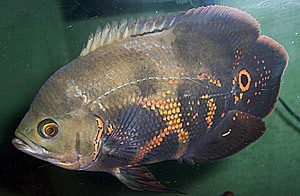 They can happen, because sometimes the full grown fish are sold after fights or rubbed against the ornaments in the tank. That type of sores is not dangerous if we are sure they were mechanically inflicted. We should be able to distinguish them from the early symptoms of HITH. They can be distinguished by the depth of the wound (HITH holes go deep, mechanical sores are on the surface of the skin), scratches have straight edges (HITH has round, erosion like wounds, with fluent edge between the healthy and sore tissue). There should be no other changes on the skin like bumps, deep muscle wounds, ulcers or pustules etc. - Fins should not be damaged, fringed, coloured in any way, especially white or blood tinge indicates inflammation or fin rot. Fin rays should be shaped properly, the fins should not be closed up or flexed unnaturally. -	Fish should be big enough for its age. 5cm fish are about 2 months old, 1 year well fed specimen is about 25-30cm long. - The eyes should be proportional to the size of the body - small fish with big eyes is older than the body size suggests, if it is an adult specimen it will probably not grow anymore. - The body should be proportional, athletic, the silhouette oval. Eyes proportional, a little protruding, the lower jaw - especially when the fish is mature - should be moved to the front of the face and up (it indicates the feeding way, collecting the insects from the water surface). Thin, skinny specimen with big heads and eyes should be eliminated from the group - they usually grow extremely slowly and after maturation remind "rat-like". The body cannot be too short and bulbous - let us not allow the seller to offer us "a balloon" variety of the fish. 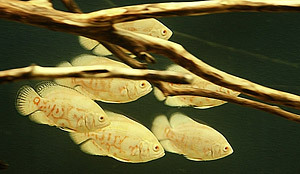 - Colours - young fish should have fairly little red marks, its number increases with age. It is a common practice these days to stuff the young fish with testosterone to present adult colours similar to the full grown specimen. 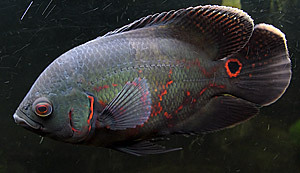 After you buy such a fish its colours fade to the youngst's appearance (with less intense red, or less amount of it) and re-appear when the fish matures. I do not know the damage such a hormone treatment can cause. It is better to buy the fish from a breeder when we can see its parents - we can buy the specimen which will be similar to the parents in the future. The colours of the full grown fish should be clear and typical for a given variety. Pale colours should not disqualify the fish - perhaps it ate too little pigment food - what can be clarified while talking with the breeder. - The water in which the fish - especially young - swim in the store should be clear. A greenish or bluish tinge indicates the medical treatment - usually smallpox, which we often buy with the young fish (they are being kept in disastrous conditions due to their cheap price and high durability). - Young Oscars usually get excited when someone appears near the tank (a chance for food). If they are dull, do not react or are extremely easy to scare, you should be cautious. Full grown fish are usually calmer - I talk about tanks in the shops. In the tank at home our fish should appear near the glass at the smallest stir in the room. - The bellies of the fish should not be sunken. The drops of the fish should have proper colour: red if the fish are fed with granulated food, brown to black when they are meat-fed, shiny black when fish-fed etc. They should always be short and breakable. Long, stringy, white excrements indicate the alimantary canal infection. If we verified the fish positively, we can buy them with fairly clear conscience. To make sure they are healthy we should keep them in quarantine tank at least for a week and without any soil, so we could see all the possible disease symptoms. The real quarantine should last 5-6 times longer but if Oscars are to be the only inhabitants of the tank (what I recommend), we can put them to a proper tank after a week and enjoy them.